Simple & Sincere: Three Cheers - The New Catalog is Here! Wahoo! The wait is over and the new catalog is finally here. I am SO excited! And this weekend I get to participate in a shoebox swap using some of the new goodies from the catalog - yippee! I can't wait. As part of the meeting, we are also doing a card swap and this is one of the swaps I will be trading with my fellow demos. I was inspired by the layout for the Sweet Sunday Sketch Challenge #157. I am not usually a diagonal layer person - it makes me a little twitchy, what with my Type A personality and all - but I just felt like this would be a fun sketch to work with so I gave it a shot. 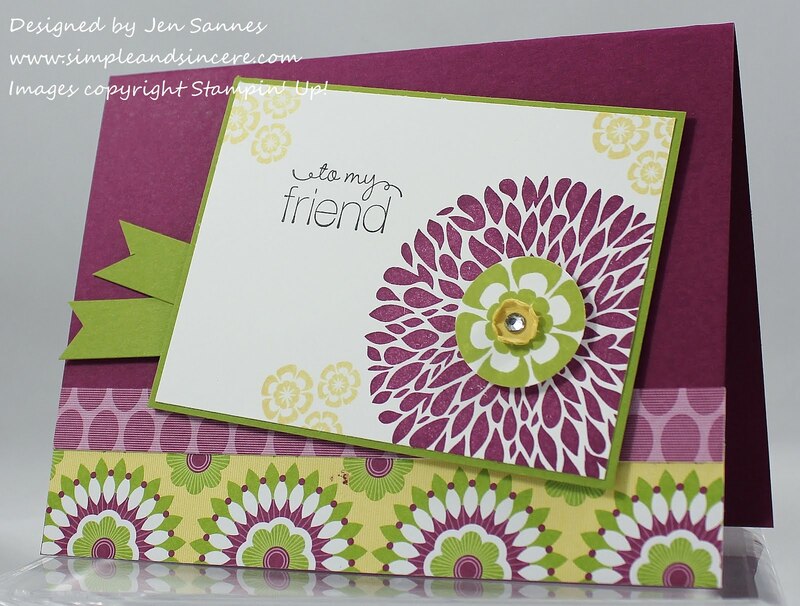 I love the bright colors of this new dsp called Floral District and the patterns are fun and funky. You can also see that I used the new Betsy's Blossoms stamp set. My fingers are itchin' to get stampin' so I will leave it at that! On a personal note, I will be running my first ever 10K tomorrow morning. This is a goal I set for myself last summer and I am so excited, but a little nervous, too. If you think of it, you can say a little prayer for me about 8:30am on Saturday morning. :) Have a fabulous weekend! GOOD LUCK with your 10k tomorrow! I'm a runner and love it. Be careful, those races are ADDICTING!! Enjoy the race! Hi Jen! Love your swap card! SO pretty and fresh looking. Best of luck to you on your race. I'm training for a half marathon in the fall. I've only done a 5k, so I'm nervous about that as well. I know you'll do great and I will say a prayer for you too! Jen just wanted to say Congrats for being chosen as a member with FMS. I look forward to adding your blog to my favorites. Love what I see here. hugs.